The June-July 1989 issue of NYC DOC's Correction News carried text and photos on the dedication of C-73 facility on Rikers Island as the George Motchan Detention Center. A Rikers Island jail was renamed for a correction officer who was killed when an inmate shot his way out of a hospital dental clinic 14 years ago. The issue also included coverage on naming Riker's HDM the James A. Thomas Center and on the sudden passing of Warden Otis Bantum. 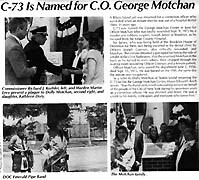 C-73 was named the George Motchan Center in June for Officer Motchan who was fatally wounded Sept. 9, 1975 by a murder and robbery suspect, Joseph James of Brooklyn, as he escaped from the Kings County Hospital. Mr. James, who was being held at the Brooklyn House of Detention for Men, was being escorted to the dental clinic by Officers Joseph Connors, also critically wounded, and Motchan. The inmate obtained a gun taped for him to the side of a toilet in the clinic bathroom, shot the unarmed Motchan in the back as he turned to warn others, then charged throug the waiting room, wounding Officer Connors and a female patient. 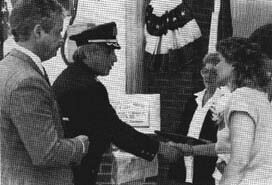 Commissioner Richard Koehler, left, and Warden Martin Levy present a plaque to Dolly Motchan, second right, and daughter, Kathleen Dory. Officer Motchan, who joined the Department June 2, 1958, died Sept. 15, 1975. He was buried on the 19th, the same the inmate was recaptured. "Your husband performed outstanding service on behalf of the people of the City of New York during his seventeen years as a correction officer. He was devoted and brave. He was a credit to his family, colleagues and everyone who knew him."